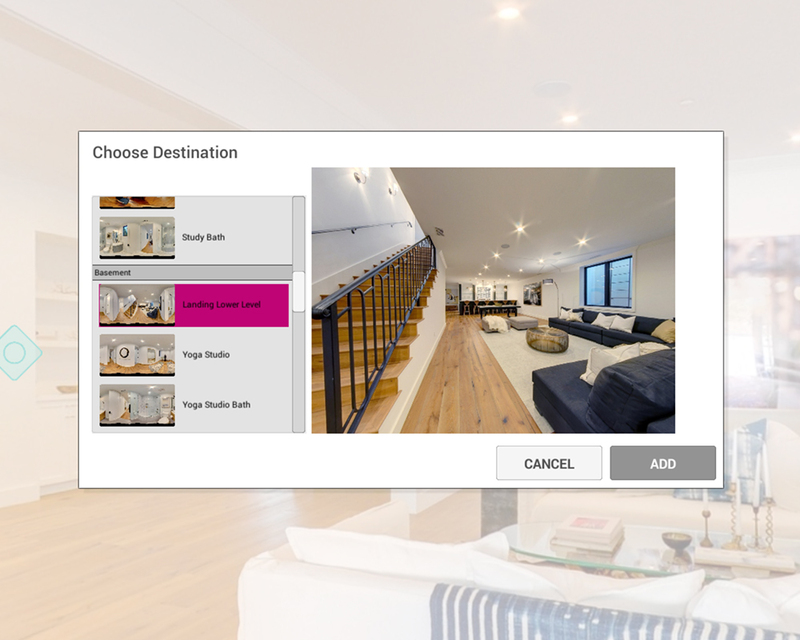 Transported Creator is our authoring tool for building tours. Learn how easy it is to get started. 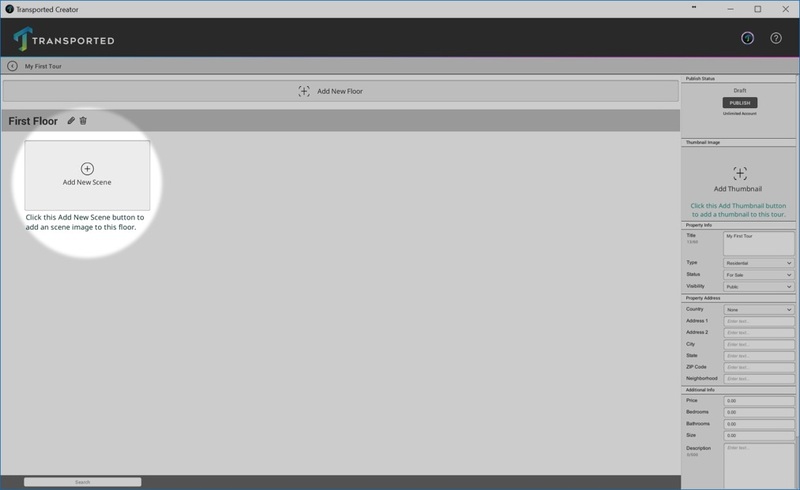 To get started quickly with Transported Creator, follow this guide. Then for more in-depth documentation and help, browse through our knowledge base. If you haven't already done so, download and install Transported Creator on your Mac or Windows computer. You'll find the download link in the dropdown menu under your email address when you're logged in. Be sure to check out the minimum system requirements. Make sure that your 360° photos are ready. They need to be already stitched and saved as equirectangular JPEGs. We recommend 8192 x 4096 pixels, with 4096 x 2048 being the minimum size. Also, it's a really good idea to name them in the order in which you'd like the tour to go, for example: 01_Streetview.jpg, 02_Front Door.jpg, 03_Foyer.jpg. Finally you'll need a thumbnail image that will be representative of the property. A good 2D shot will be great for this. When you launch Transported Creator, you'll need to log into your account. Just type in your email address and password. Check the Remember Me box if you'd like to automatically log in each time you launch Creator. As of version 1.2, Transported Creator will start with a series of overlay tutorials to help you publish your first tour. You can always reset those panels by selecting Help > Show Tutorials. 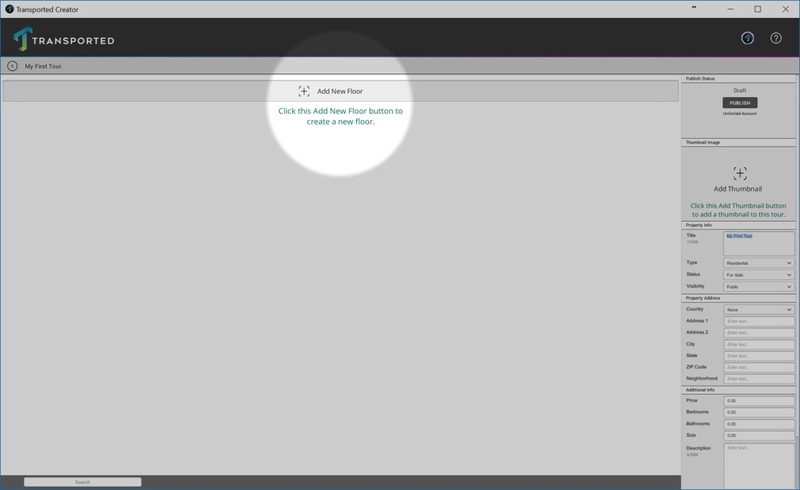 Click the large Create New Tour button in under Drafts to start the new tour creation process. Once created, go ahead and fill in as much information as you can about the property in the sidebar on the right. Make sure you click the Add Thumbnail button to add a 2D thumbnail image. This image is used when users are browsing through the VR showcase. All scenes must belong to a Floor. 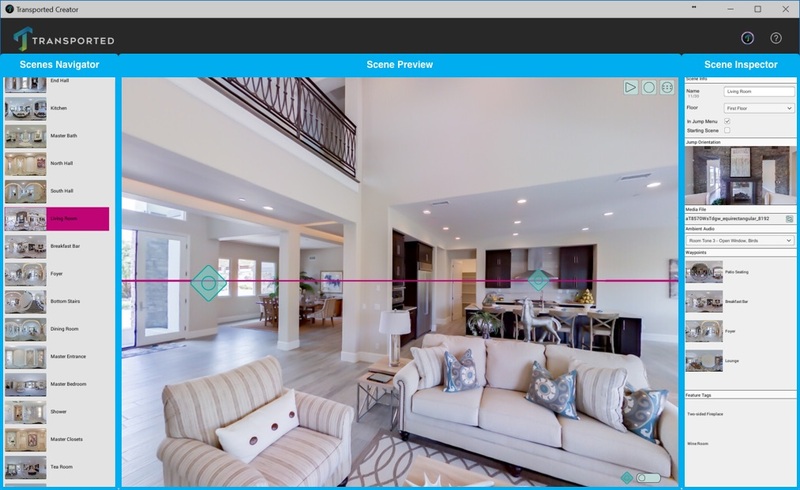 Even if the scene is outside, the “Outside” can be a “floor.” Click the Add New Floor button to add a new floor. Choose from one of the preset floor names or add a custom one. Once you’ve added a floor, add scenes to your tour by clicking on the Add New Scene button for that floor. When the file browser comes up, select one or more of your equirectangular JPEGs (hold down the shift key to select more than one). Once the clips are processed, it's time to edit your first scene. The Scene Editor is laid out as above. The left sidebar is the Scenes Navigator. You can click to edit another scene. The highlighted scene is the one you're currently working on. The center viewport is the Scene Preview. Click and drag to spin around in the scene and to place objects in the scene. Floor: This helps to group the scenes together in logical groupings. What floor is this scene is in? Set up a custom floor if necessary. In Jump Menu: Will this scene be displayed in the Jump Menu? We suggest that you turn this off for small things like a stairway. Starting Scene: Check this box if you want to set this scene as the first scene in the tour. When jumping into a scene, the user needs to face something in particular. Drag the scene in the middle and then use the camera icon in this section to set it as the default orientation when jumping in. This is the name of the JPEG for this scene. If you need to change the file for whatever reason (e.g. to improve its color), you can replace the file here without having to redo all your scene work. For a more immersive experience in VR, select the best audio clip to play for this scene. You can add custom audio here too if you've captured audio onsite. Waypoints are how a user travels from one scene to the next. This section shows all the waypoints in this scene. Feature tags are points in the scene that can reveal more information about something in the scene. You can even add audio to it if you wish. To add a waypoint to your scene, look in the Scenes Preview area and make sure the toggle is flipped to the left, to Waypoint mode. It is advised to place waypoints along the guide. Placement at this height makes for an optimal user experience in both VR and on the web. Once you know where you want to place your waypoint, simply click once to place it. Now drag your mouse up or down to control how close it is to the camera. The bigger it is, the closer to the viewer it will be. Click again to lock it in place. This will then bring up a dialog box where you will choose where this waypoint will take the user. Choose from the list on the left and use the preview to make sure it's the right destination. Click Add when done. To point something out in a scene, add a feature tag on it. 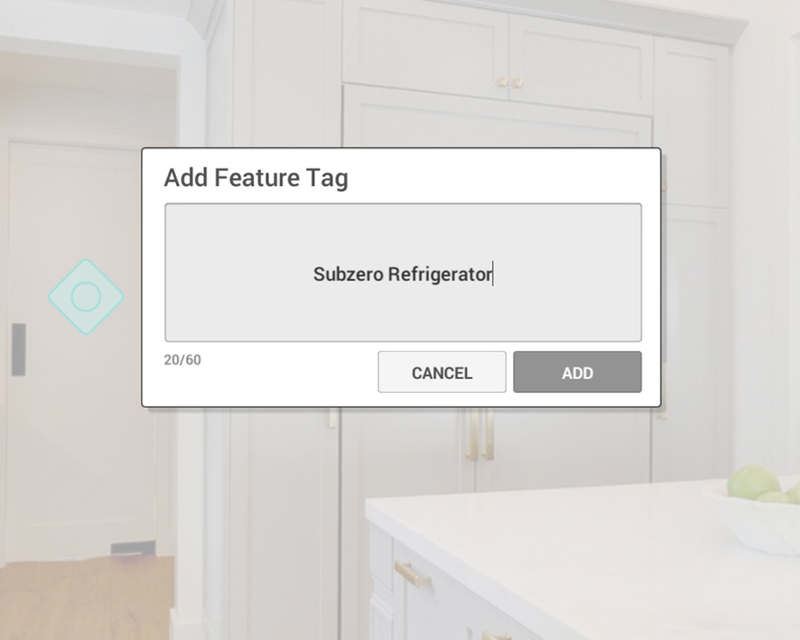 In the Scenes Preview area, make sure the toggle is flipped to the right, to Feature Tag mode. Then click where you want it placed in the scene. Click again to lock in its depth. Type the text you want to appear when the user hovers over this tag. Once it's added you can add an audio file to this by clicking the microphone button. Once you have all your scenes imported, named, assigned to floors, and every scene linked, and have set a thumbnail image, you are ready to publish. Double-check your tour info in the Organizer. Tours set to Hidden will only be available to those with a specific link. 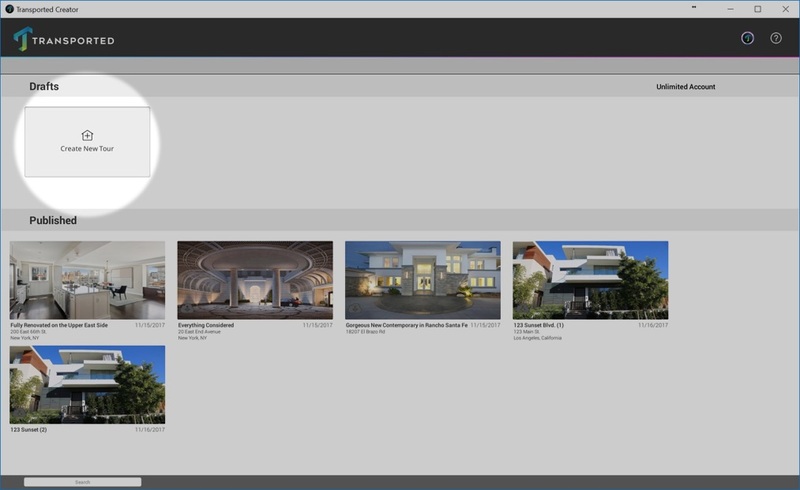 Tours set to Public will appear everywhere, such as in user profiles, searches, any lists, etc. In the Organizer, click the Publish button. It will run through a check to make sure there aren't orphaned rooms or scenes not assigned to floors. If your tour passes the check, you can hit Publish and then your tour will be live! 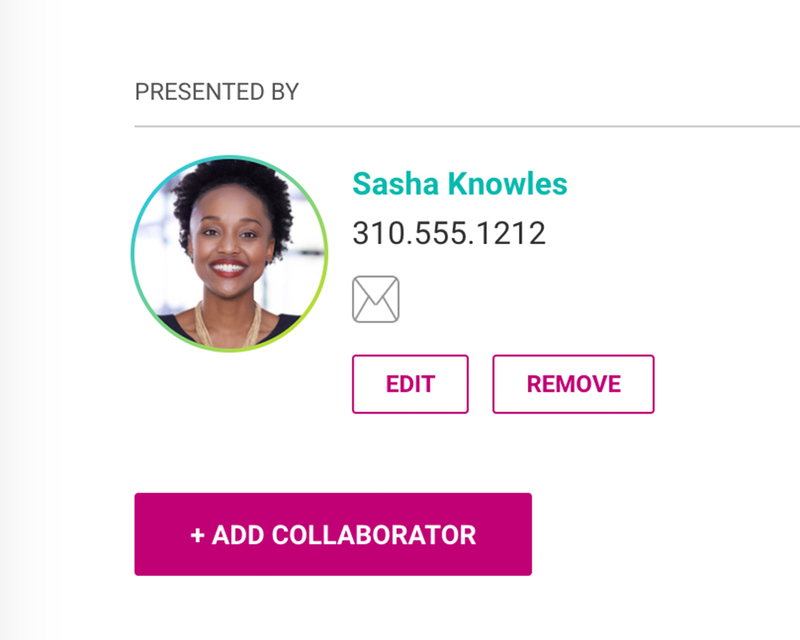 If you're creating the tour for a real estate agent or other client, you'll want to add that agent as a collaborator and assign her as a Listing Agent. In Transported Creator, after publishing, a dialog appears with a link to add collaborators to your tour. You can also do this on your logged in homepage at transported.com. Note that any collaborator you invite must already have a Transported account. They can sign up for free on this page. For some quick tips and tricks to create great tours please see our Best Practices guide.